An exhibition exploring the design process of the most significant twentieth-century Persian newspaper types. An exhibition of books about exploring, trekking and travelling in Central Asia, next to the Reading Room. 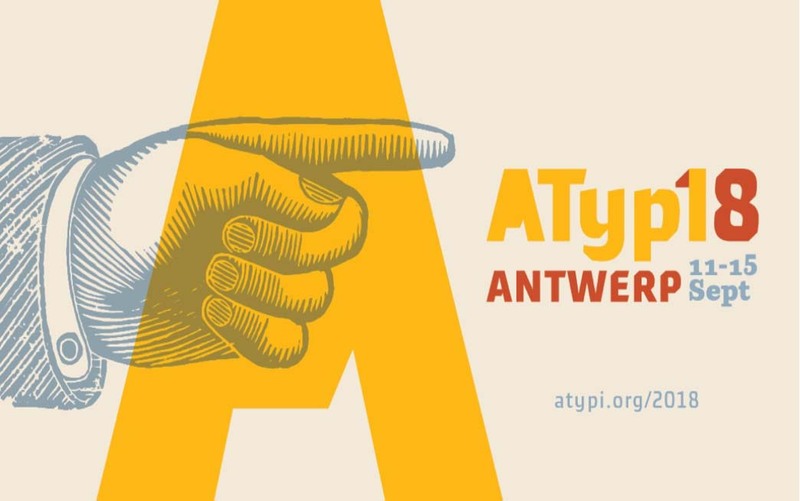 Our use of the Lettering, Printing and Graphic Design Collections in the Typography Department, and our distinctive approach to collections-based research, was exceptionally well demonstrated at the 2018 ATypI conference in Antwerp. We enjoyed top quality presentations by Typography staff and PhD students. In a conference with over 550 international delegates, who repeatedly mentioned the ‘Reading’ influence in conversations and comments, it was humbling to realise just how influential and significant our work with collections has been in developing new knowledge about type and typography, and in inspiring people to undertake research. We’re pleased to announce the continuation of our exhibition, ‘Letterpress: possibilities & practice’, until Friday 20 July 2018. 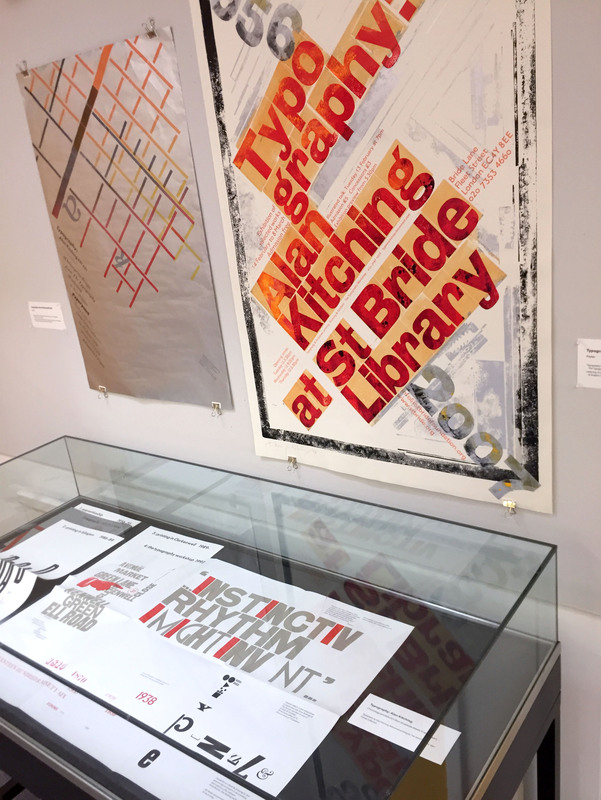 Stop by to see a range of innovative letterpress practices and possibilities. To tempt you, two practices in the exhibition are featured below. Read on! 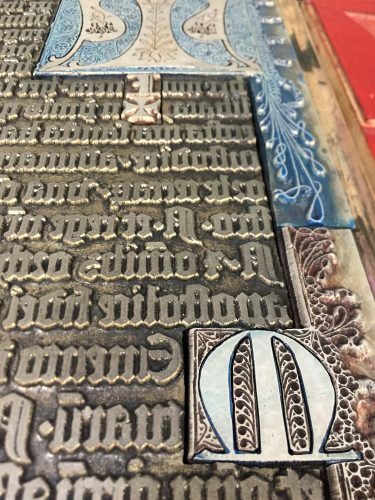 Letterpress printing practice encompasses scholarly investigations of historical typography in pursuit of new knowledge. 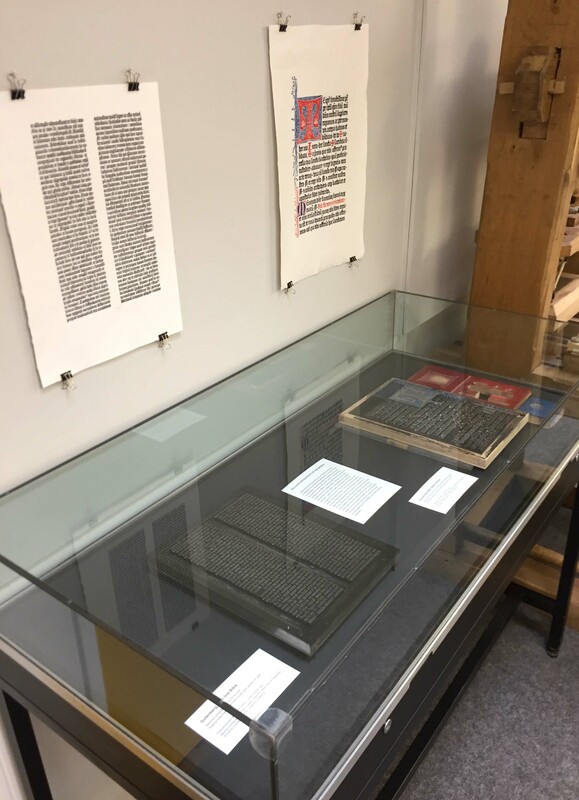 The two examples on display here involve the reconstruction of fifteenth-century relief printing surfaces in an effort to better understand the production of well known incunable works. The type on the left (in the image, below) is a facsimile of that used in Gutenberg’s 42-line Bible, printed in 1455. It has been composed to replicate a page from that book. The type was produced as part a BBC Four documentary, ‘The machine that made us’, on the life and work of Johannes Gutenberg, featuring Alan May alongside Martin Andrews and Stephen Fry. 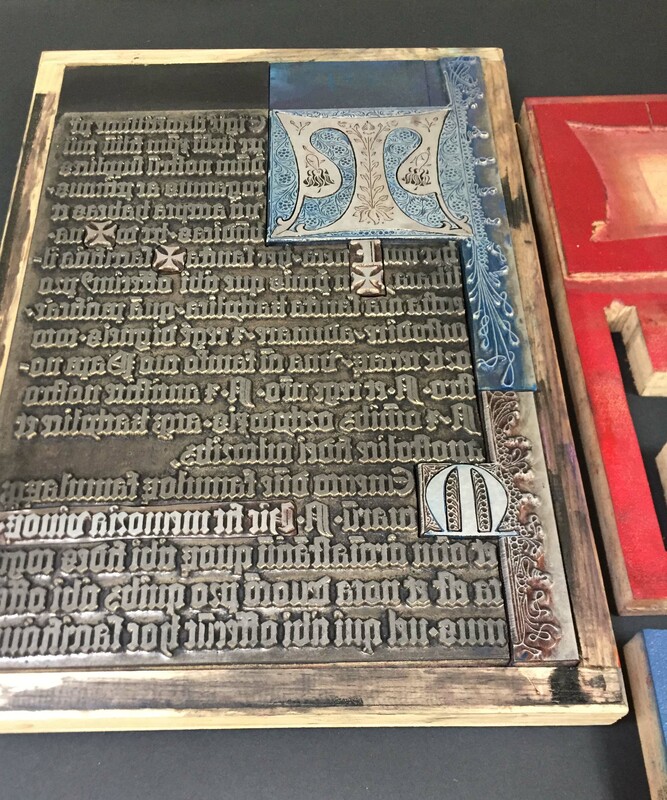 On the right are type and decorated borders and initials that together comprise a speculative reconstruction of the relief surfaces used to print a multi-coloured page from the 1457 Mainz Psalter of Fust & Schoeffer. The reconstruction was part of a research project to investigate Fust & Schoeffer’s probable working methods. Reconstructing historical typography. Gutenberg, 42-line Bible. Reconstructed B-42 printing type (in vitrine, at left); page printed from reconstructed type (on wall, at left). Produced by Alan May and others, c. 2008 (original: 1455). Fust & Schoeffer, Mainz Psalter. Reconstructed three-colour printing surface; blocks for single-colour pre-inking (in vitrine, at right); printed page (on wall, at right). Produced by Alan May, c. 2013 (original: 1457). Gutenberg, 42-line Bible. Reconstructed B-42 printing type (detail). Fust & Schoeffer, Mainz Psalter. Reconstructed three-colour printing surface; blocks for single-colour pre-inking (at right). Fust & Schoeffer, Mainz Psalter. Reconstructed three-colour printing surface (detail). This work has been created by the Leipzig designer, Pierre Pané-Farré. It takes its inspiration from compound-plate printing, a nineteenth-century technique that exploited multiple interlocking printing surfaces. Inked separately (in different colours) and then combined, a single impression would be taken from the interlocking surfaces, resulting in precisely aligned multicolour printed images. Pané-Farré has revisited the technique using laser-cut MDF printing surfaces, which produced the various sets of interlocking components displayed here. Ink was applied to each component in the set, either as ‘flat’ colour or in graduated hues. The set was then printed in a single impression to produce the polychromatic prints. The project was accompanied by the publication of Die polychrome Druckerei (Leipzig: Institut für Buchkunst, 2014), which reproduces the prints in four-colour offset lithography. Pané-Farré cites Michael Twyman’s book, Printing 1770–1970 (1970), and Maureen Greenland’s doctoral thesis, ‘Compound-plate printing: a study of a nineteenth-century colour printing process’ (University of Reading, 1996), as starting points for his work. Re-invention of historical technique. 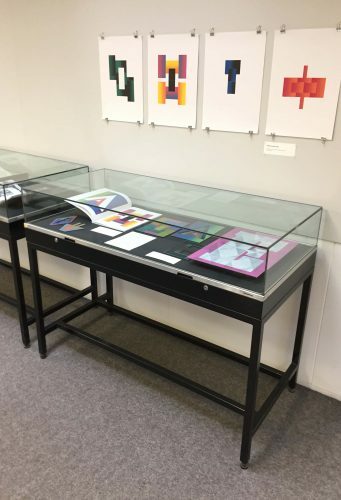 Polychromatic prints (on wall, 2013–14); Die polychrome Drukerei (book in vitrine, at left, 2014); sets of printing surfaces (in vitrine, 2011–13). All items conceived, designed/written, and produced by Pierre Pané-Farré, Leipzig. Detail of sets of printing surfaces (laser-cut MDF). Surfaces show the residue of their last-printed colour(s). 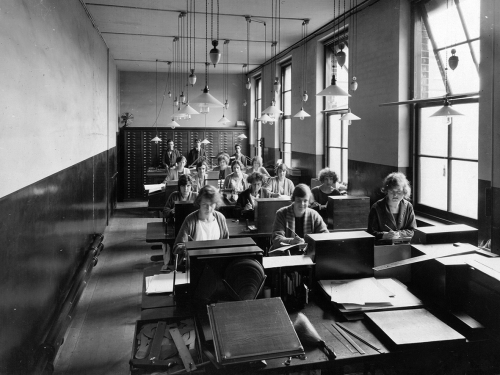 ‘Women in type: a social history of women’s role in type-drawing offices, 1910–90’ is a new three-year research project now underway in the Department, funded by the Leverhulme Trust and led by Professor Fiona Ross. The project team includes Dr Alice Savoie and Dr Helena Lekka. For more information about this exciting and timely project, see the Leverhulme Trust’s newsletter for January 2018 (p. 11). 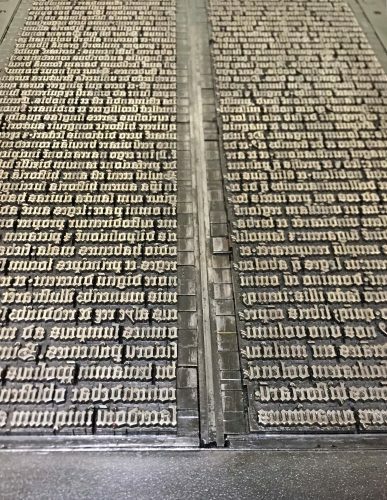 Letterpress printing has never lacked dedicated practitioners since its decline as a mainstream commercial printing process. 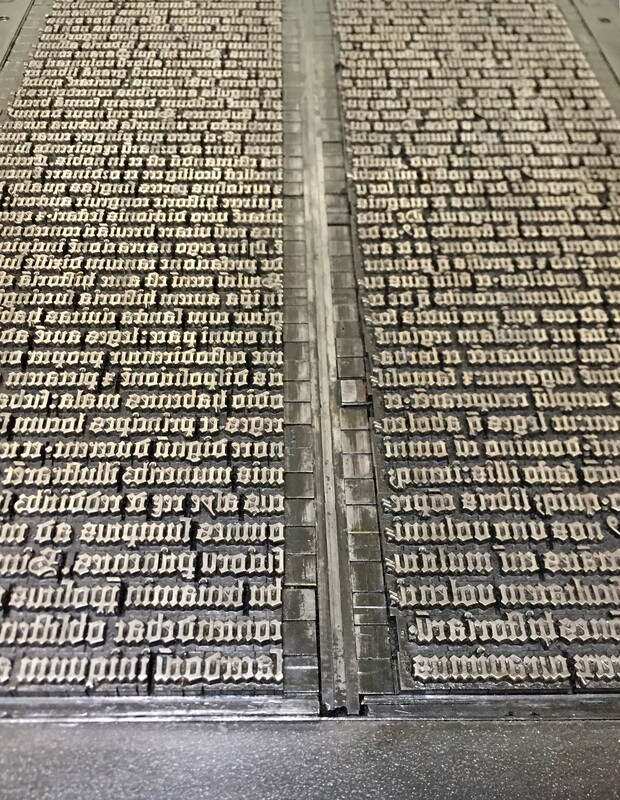 But its conspicuous use in recent years – in the UK, Germany, Italy, USA, Brazil and many other places – is evidence of a resurgent interest in letterpress as an engine for research, design and making. Driving this interest is in part a renewed valuation of the materiality of print as a counterweight to the disembodied digital form of much present-day typography and graphic communication. Recent letterpress practices are renovating and expanding the process. This exhibition presents some of these practices, alongside complementary examples from the 1980s and 90s. 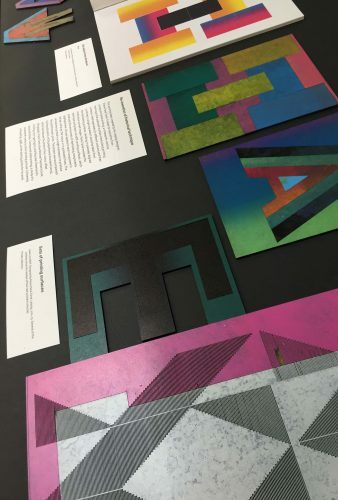 They involve the exploration of print effects, the visual formation of language, the reconstruction or reinvention of historical technique, the reconfiguration of letterpress in ‘post-digital’ form, and more. Taken together, the work on display suggests that letterpress printing continues to offer many possibilities for scholarly, speculative and commercial endeavour. Thanks to those individuals who have kindly loaned items for exhibition: Simon Esterson, Gerry Leonidas, Pierre Pané-Farré, Erik Spiekermann, Ferdinand Ulrich, Susann Vatnedal. Display and texts by Eric Kindel. 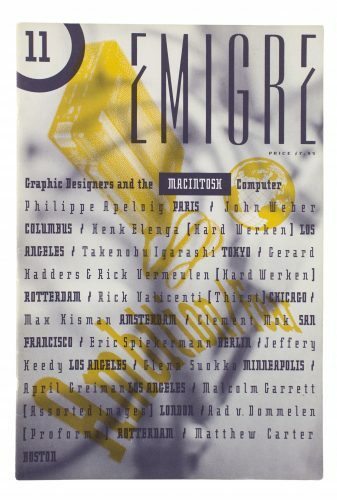 Emigre magazine, co-founded in California in 1984 by Rudy VanderLans, was a provocative and highly adventurous fusion of self-publishing, critical writing and experimental typography. This exhibition investigates a key period in the development of graphic design as a form of authorship and shows how Emigre’s page designs and typefaces embodied new thinking about the designer’s role in communication. Interviews with April Greiman and Glenn Suokko in Emigre 11, ‘Ambition/fear’, 1989. The early issues of Emigre coincided with the adoption of Macintosh computers by graphic designers. Emigre 11 is devoted to a series of interviews with designers about the new tool. The magazine’s pages often offered multiple reading paths. With an initial print run of 3,000–5,000 copies, the magazine was supported by a design studio, Emigre Graphics, and by a digital type foundry led by VanderLans’ partner Zuzana Licko. 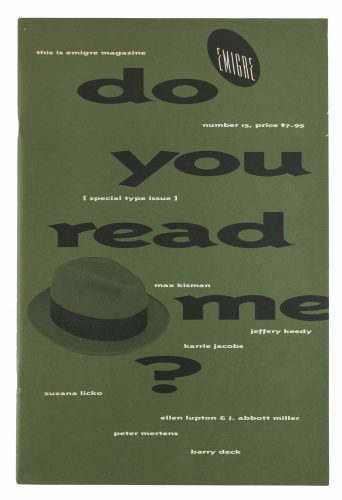 Emigre published 69 issues in a range of formats, from tabloid to paperback book, before closing in 2005, and it was probably the most admired, influential and criticised design magazine of its era. Emigre 15 cover, ‘Do you read me?’, 1990. This issue, focused on new typefaces and legibility, features typeface designs and interviews with Peter Mertens, Zuzana Licko, John Downer, Jeffery Keedy and Barry Deck, among others. In the 1990s, the idea that graphic design could be a form of authorship was the focus of intense debate among designers. 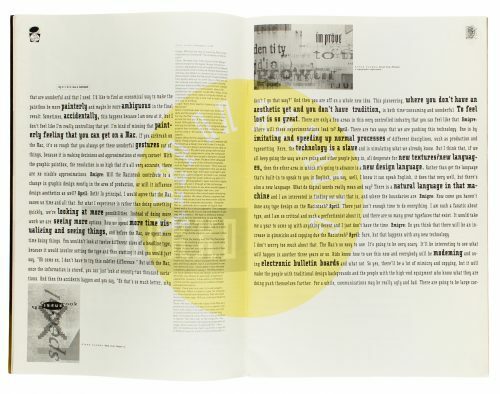 VanderLans created a vital forum for discussion during a period of rapid change and Emigre’s design and content inspired an international network of visual communicators. The magazine was an era-defining example of entrepreneurial design authorship, which still has lessons for self-publishers today, and a platform where designers could explore the relationship of writing and design.